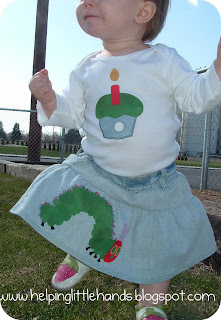 I had planned to give you the pattern for the cute cupcake applique today, but when I got this post finished, I couldn't wait! I've been wanting to write this tutorial for a couple months, but I wanted to get it right. I didn't take enough good pictures the first time through, so I had to wait until I'd made my second skirt. Seriously, I love, Love, LOVE these skirts and I hope you do too! 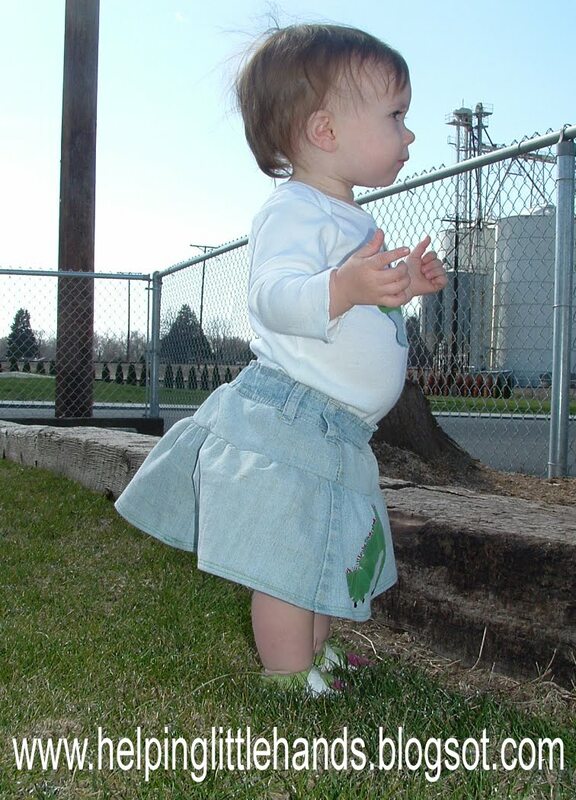 I think it's adorable when little kids wear "grown-up" fibers (denim, khaki, cordoroy, etc) that have been embellished just enough for their age, so reusing Mom's (or Dad's) pants and adding some cuteness works perfectly. 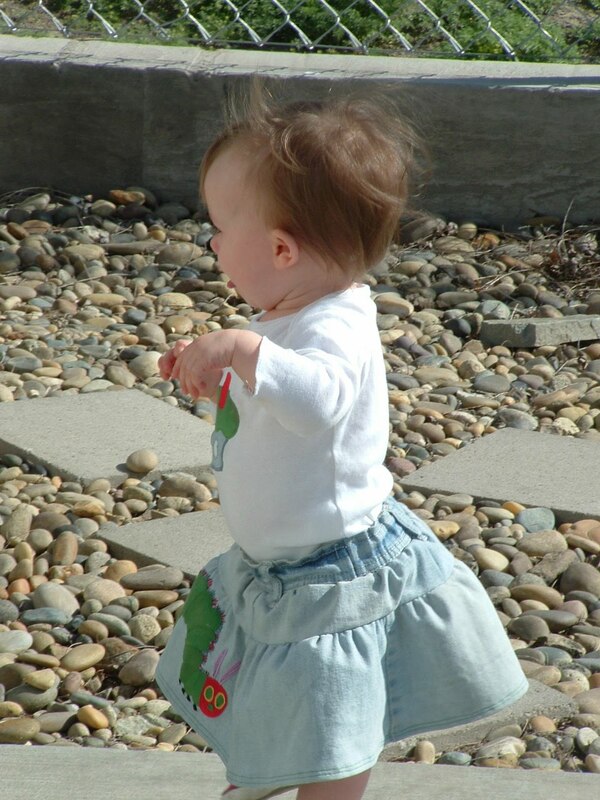 This pattern is also super easy and has added cuteness since it reuses the original waistband! 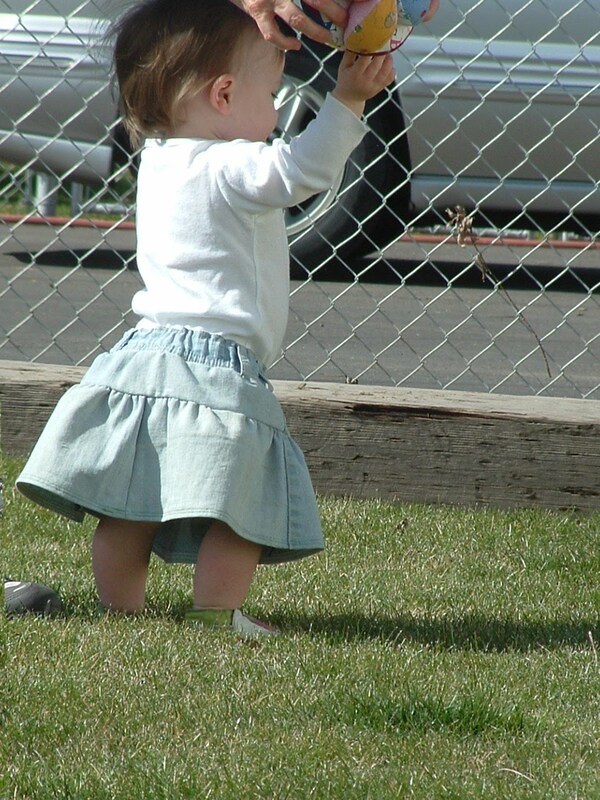 Tiered Ruffle Skirts are very forgiving. The ruffles can be just about any width, and the rings can be different lengths as well. Each ring gets bigger than the one before it, so the skirt gets more full with each ruffle. You can adjust the measurements I've given here in any direction to better fit your child and they should still work. I did a tutorial several weeks ago using this method for a skirt for my 5-year-old. 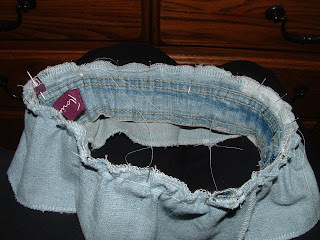 For that skirt, you have to make your own waistband. The waistbands for the two skirts could be interchangeable though. 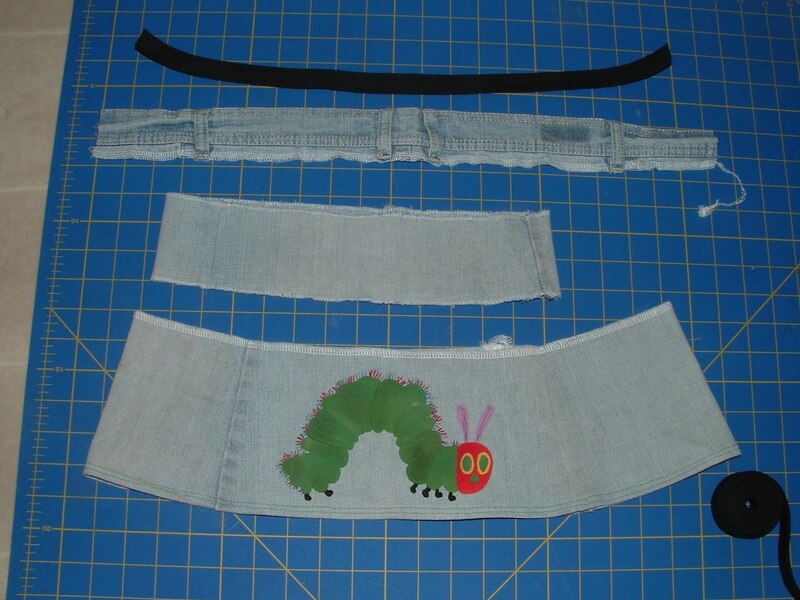 Elastic long enough to go around your child's waist plus one inch. 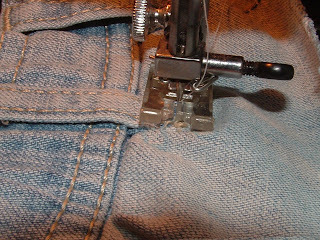 So far I have done this with a pair of black light weight cordoroy pants as well as a pair of light weight stretch denim jeans. Both times the pants were size 10 and I was able to have just enough to make a skirt for my 5 year old and a skirt for my 12 month old. Note: For the directions for the 5 -year-old's skirt, you can see my first tutorial here. For my 5 year old's skirt, I cut an 8 inch strip and two 5 inch strips from EACH leg. The exact width of the strips is not super important. You'd want them wider for an older child or shorter for a younger child. The top and bottom ruffle will need to be the same width as each other, though, as you'll see in a bit. 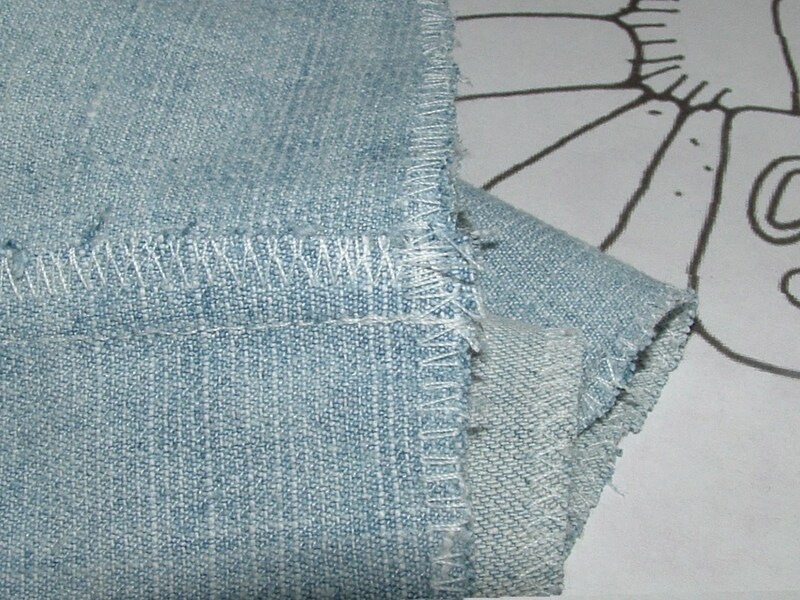 When you're deciding how wide you want the ruffle, remember that you'll need to add a couple inches to the top for a waistband (unless you're going to reuse the waistband from the jeans, as will be shown a bit later) and an inch to half inch to the bottom depending on how wide you're going to make the hem. For my 12 month old's skirt, I cut a 6 inch strip from EACH leg, as well as a 3 inch strip from EACH leg. I also cut the waistband off the pants. 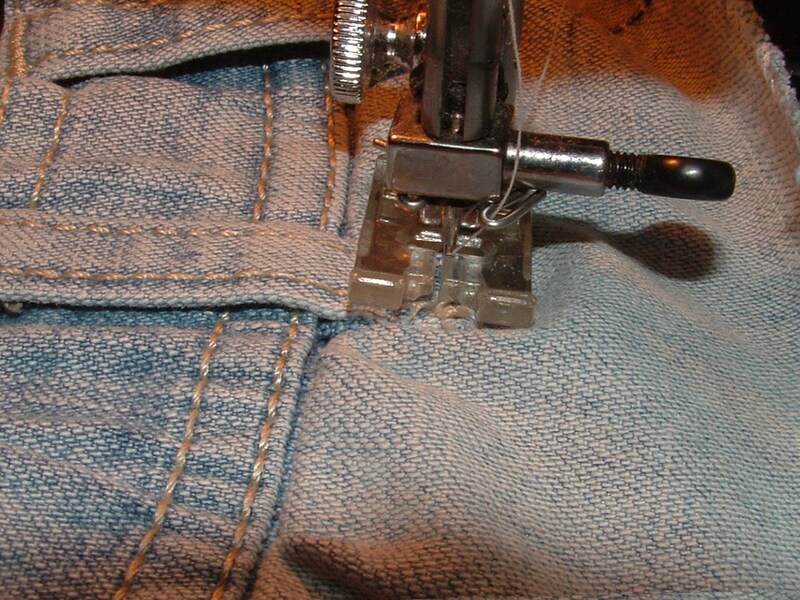 Make sure to leave a half inch or so of below the waistband for a seam allowance. You'll probably have to to a little seam ripping to undo the bottom of the belt loops. You could take them off entirely, but I thought they'd be cute, so I just unattached the bottom and resewed them onto the skirt when I was done. 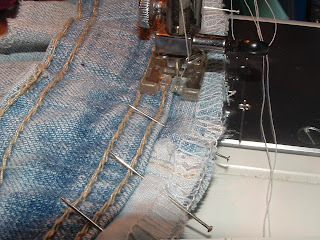 Since I started this at my inlaws' house, I used my mother-in-law's serger to serge around the edges to prevent fraying. You don't need a serger, though. Somehow the three inch strip didn't cut out until I was back home, so I just went around the edges with a zig zag stitch as you can see in the next picture below. 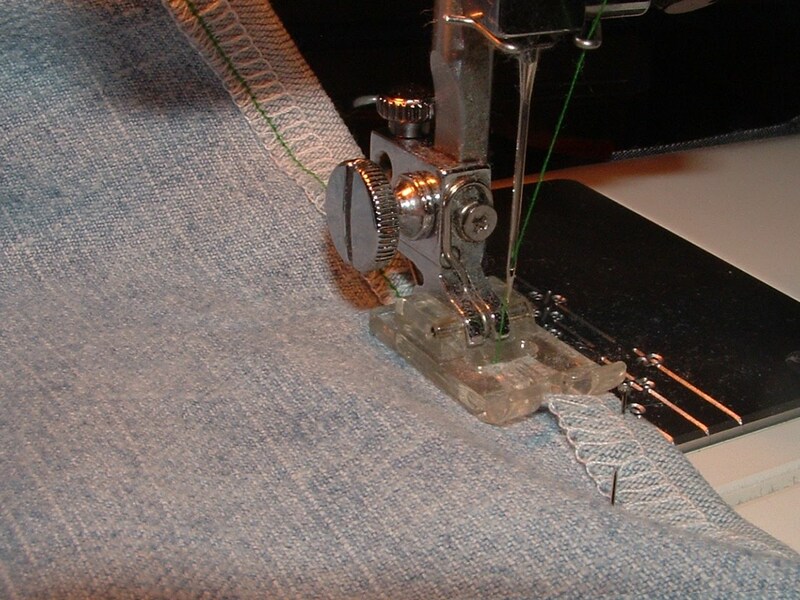 Sew the two 6 inch strips RIGHT sides together on both ends, so they make a circle. (Mine was about 44 inches around, but the exact length is not important. 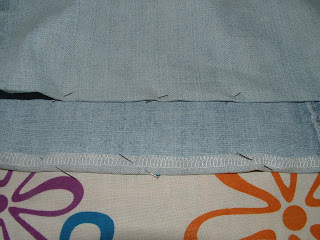 Sew the two 3 inch strips RIGHT sides together on just one end. We want this circle to be smaller than the 6 inch strips, but bigger than the waistband. In my case, I trimmed it, so all together it was about 26 inches. 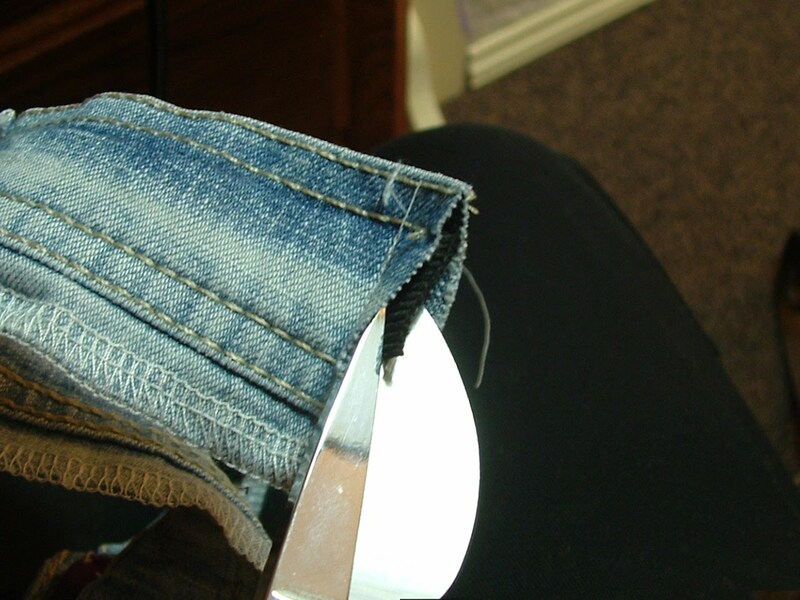 Once you've trimmed this strip, sew the remaining side together to form your circle. After I sewed the strips to form the circle, I also zig zagged the edges of those seams to help stop fraying. 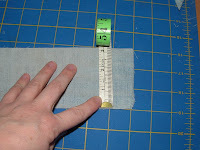 Measure your baby's bum (with their diaper on) at the widest point and add 1 inch for seam allowance. 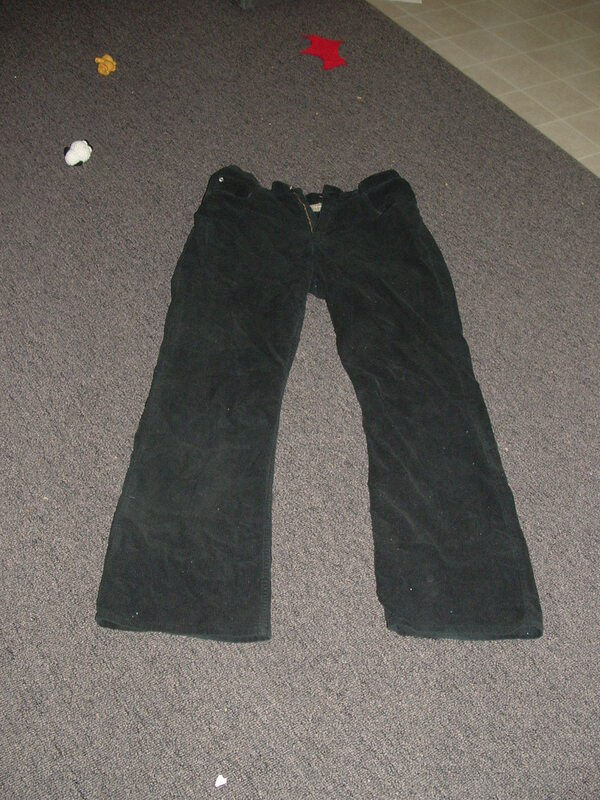 (For my baby, this was about 20 inches + 1 inch, for a total of 21 inches, so I cut a 21 inch piece of the waistband. 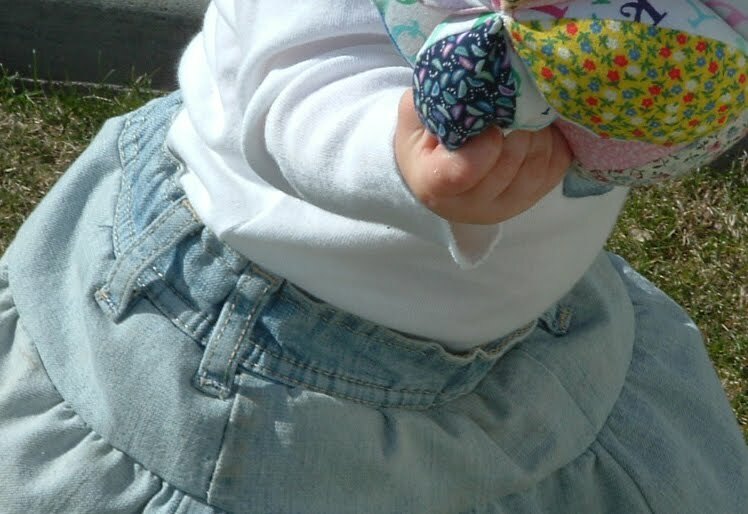 Then measure your baby's waist (about at the level of their belly button) and add 1 inch for seam allowance and cut that much elastic. For my baby that was about 18 inches + 1 inch for seam allowance. Put a large safety pin on the end of the elastic to help thread your elastic through the open space in the waistband. 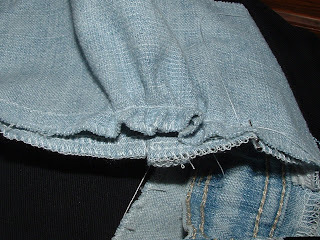 Now, I would hem the bottom of the skirt. Since my piece had been serged, I just folded it up once (about 1/2 inch) and ironed and pinned it. If you have raw edges, you'll want to fold it twice. 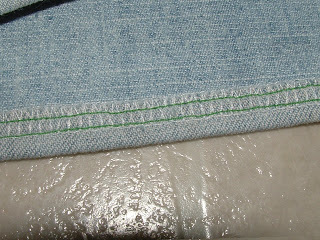 I chose to use green thread for my hem as a bit of a decoration, but you may want to use matching thread. 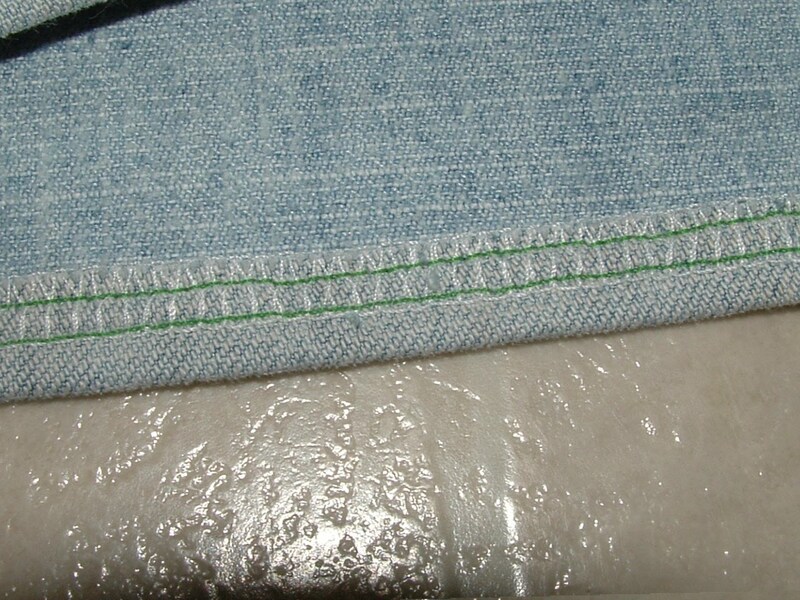 I sewed two lines of stitching to help it lay really flat, but only one line of stitching is necessary. You could also sew the hem by hand...but I try to avoid as much hand sewing as possible, just because it takes a long time. I also chose to add an applique to the skirt before sewing it all together, so there's be less material in the way. 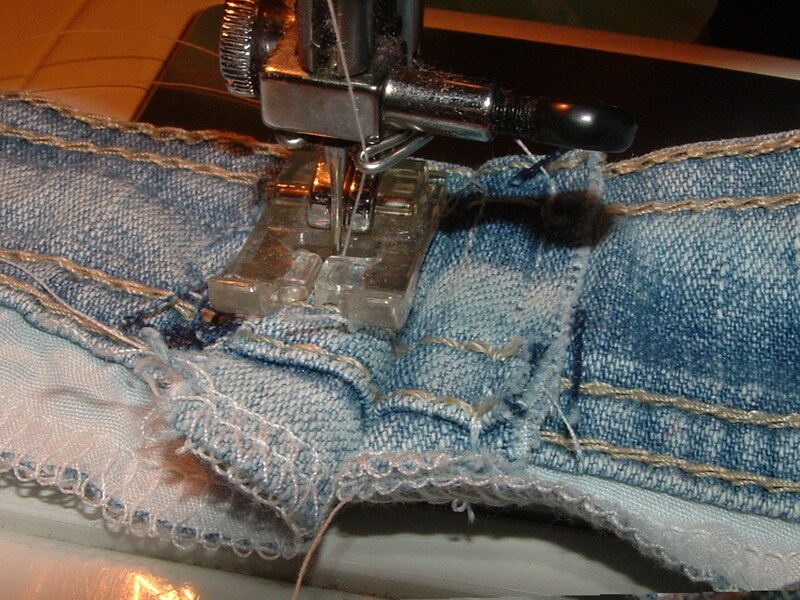 You may want to embellish your skirt now, leave the skirt plain, or embellish it when it's finished. You can get the Free Very Hungry Caterpillar Applique Pattern and Directions here. 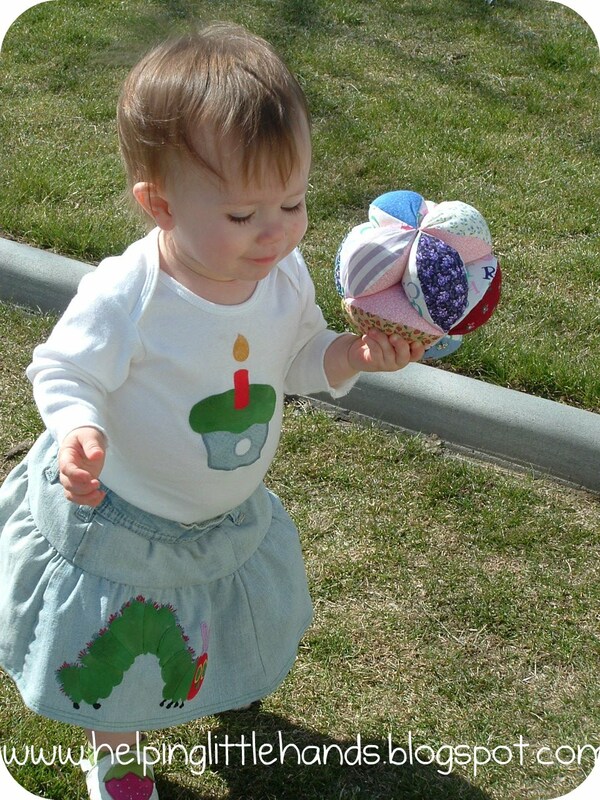 I also have a Cupcake Applique Pattern and I'll be adding other free applique patterns soon. This is approximately what pieces you should have by now. You'll notice that because there was some flair to my jeans, the skirt has a bit of a flair to it as well. It works well with or without the flair. 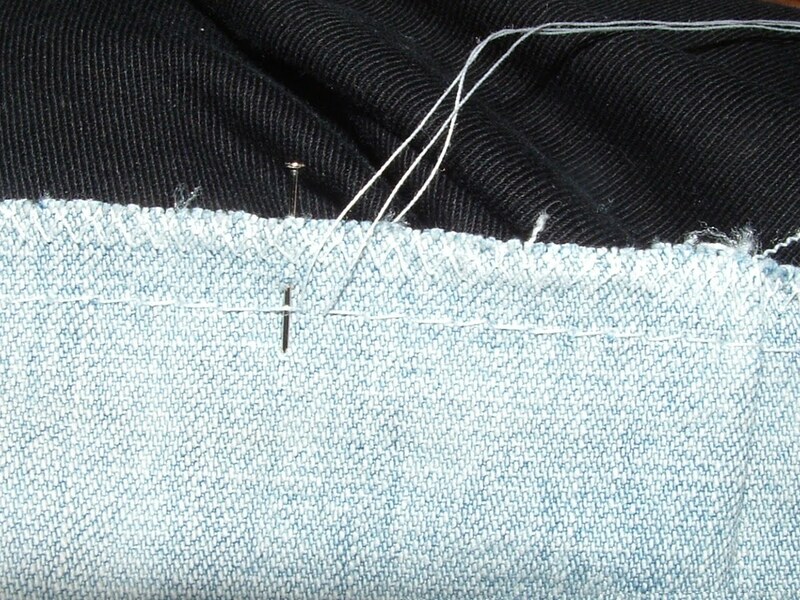 Straighter edges are a bit easier to hem, so you can trim that flair out before sewing the sections together if you want. 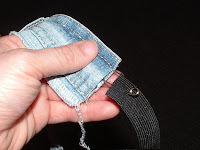 Pull the elastic through until both ends of the elastic are lined up with the ends of your waistband. Then sew to secure the elastic inside the waistband. 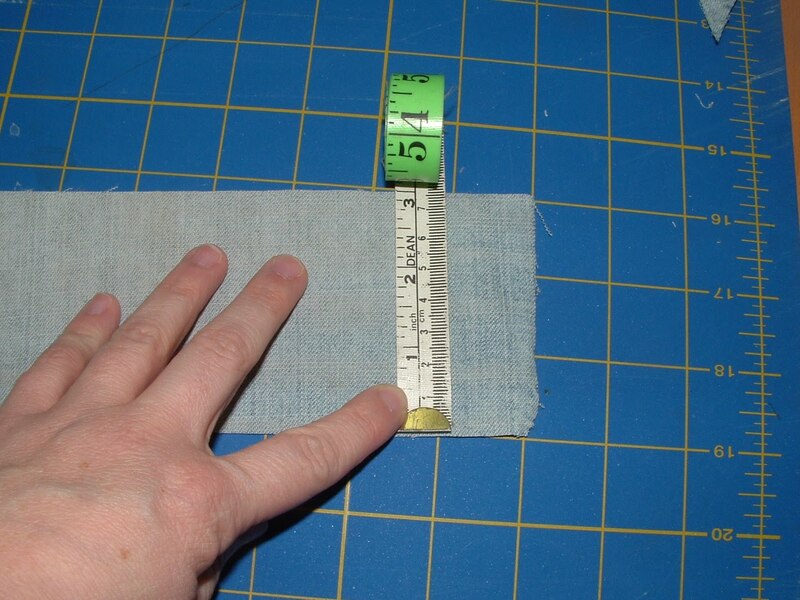 Then I trimmed the elastic that was inside the seam allowance, but to reduce the bulk. Then bring the ends of your waistband together, and stitch RIGHT sides together, with about a half inch seam. 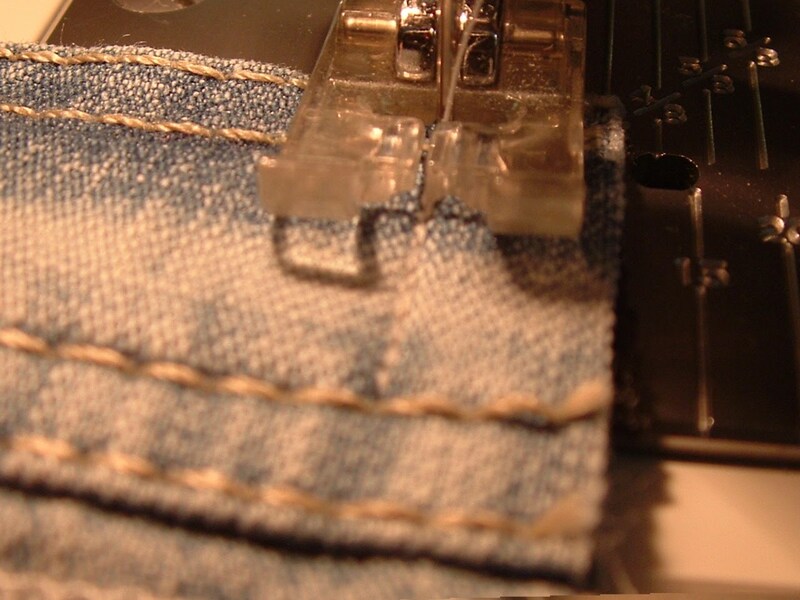 Press open and sew the seam allowance against the waistband. 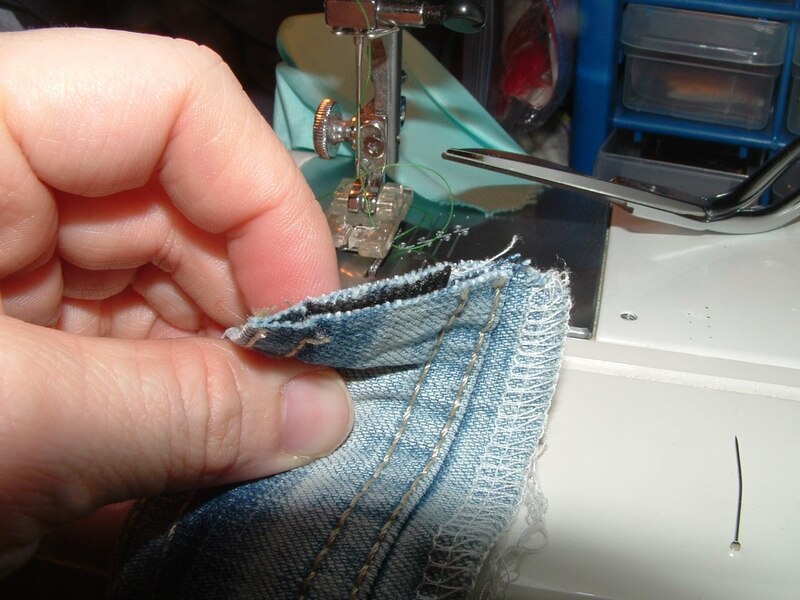 Fold your waistband into quarters by folding it in half and in half again and mark the quarters with with pins. 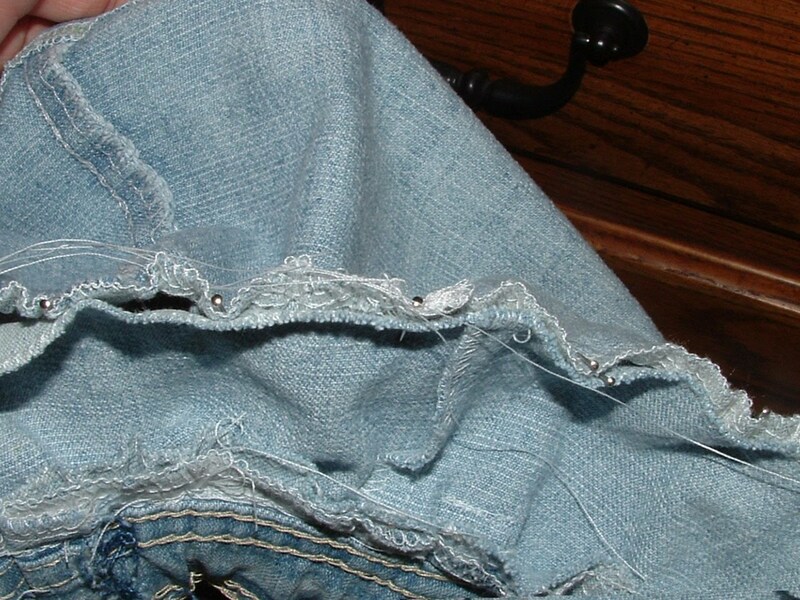 Now set aside the waistband for a bit while we get the other pieces ready. Then stitch. You'll want to do this on the waistband side and stitch right next to the waistband. Sew the bottom of your belt loops onto the skirt. Then check for any funny puckers. 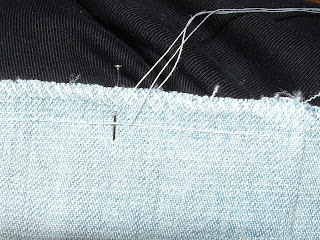 If you find any, you'll need to use a seam ripper on just that part, even out the gathers again, and restitch. Then repeat the gathering process for the bottom ruffle of your skirt. 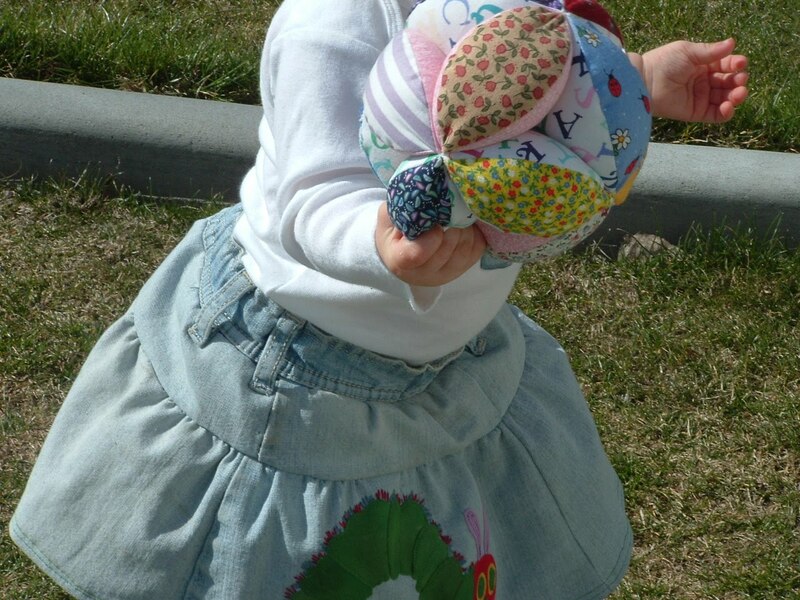 (If you like that awesome fabric ball, my mom has an easy tutorial for them here. 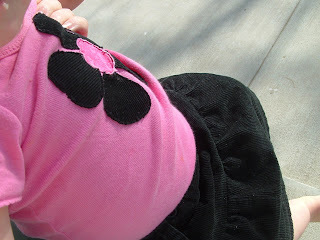 I just love how this little waistband looks around Sweet Pea's little tummy. 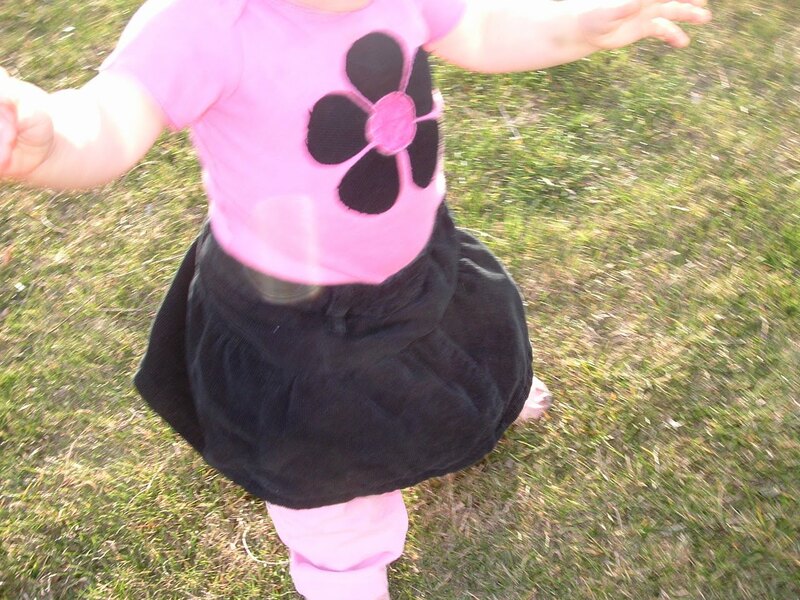 You can find the pattern for the cupcake onesie here, and the free flower applique pattern for this matching onesie can be found here. Wouldn't those petals be cute in denim?!? Join in! Grab a button. These are absolutely darling! Thanks for sharing the tutorial. LOVE this idea... I just made myself a maternity skirt from some trouser jeans and have a couple of panels of denim left over- now I know exactly what to do with it! 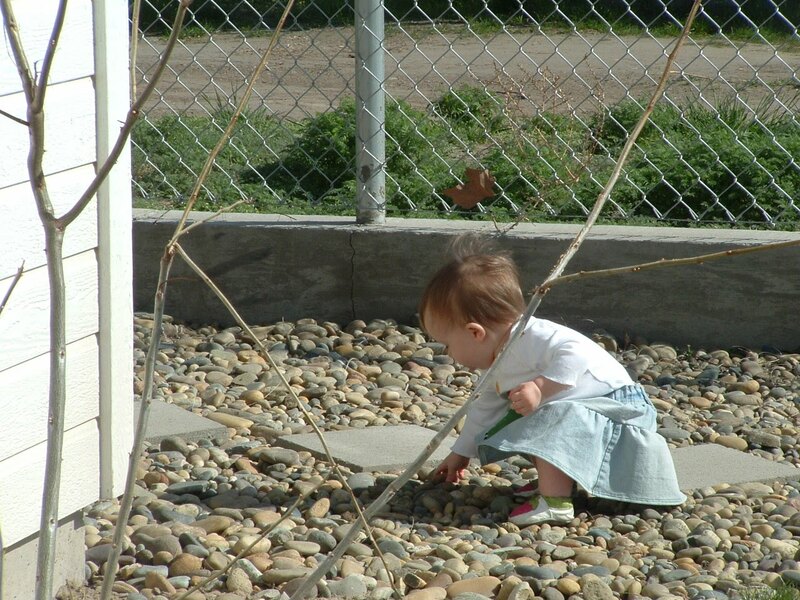 ps- I love your hand-me-down-rehab idea... fabulous! Great tutorial - and thanks for the links to Katie's post about gathering stitches! Those are adorable and so are your cute little models! That is adorable! 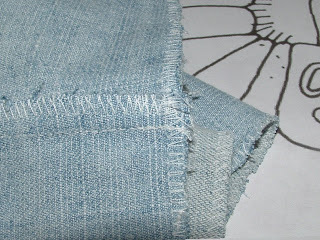 Great way to use old jeans! Very cute! I need to try and make some of those for my daughter. 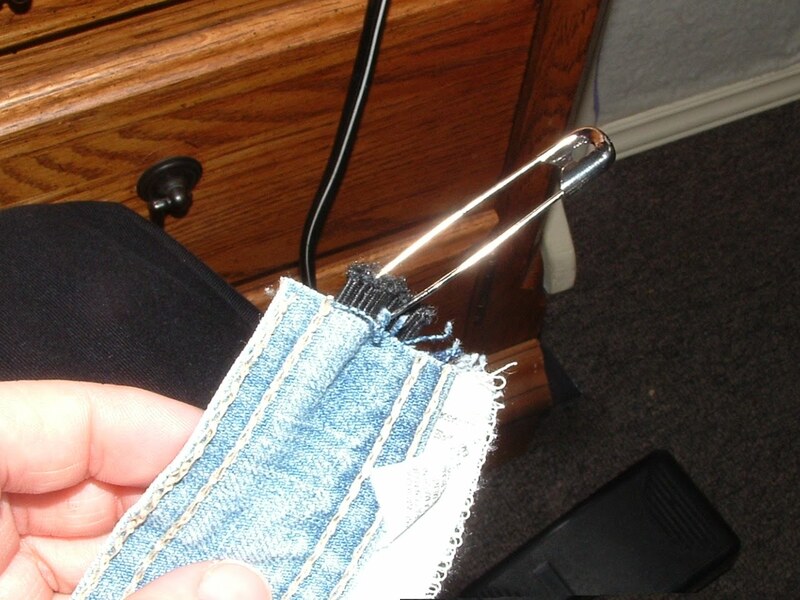 We're always giving jeans away, but now I know to keep them and make this! 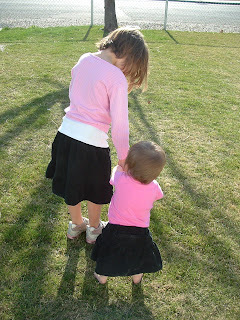 The skirts are adorable, as are your girls. I realy love how you put a hole in the cupcake! Nice touch. THanks for linking up with Sugar and Spice. Coming over from 733! Adorable!!! I want to make one of these for my daughter. I would love it if you linked this up to my party today at somedaycrafts.blogspot.com! I'm a new Follower From Thursday's Treasures Link Party! Visit me at http://www.rockindeals4you.com/?p=1398 and sign up for my newest giveaway! great tutorial! I love it! I need a girl SOO bad! THanks for linking up! I am featuring this at somedaycrafts.blogspot.com. Grab my "featured" button. Wow! They turned out so cute! Now I have something to do with those jeans except just store them in a box. Thanks. This is a great tutorial. Wow! I love this! You have an awesome tutorial here, too. Love the Hand Me Down Rehab theme!